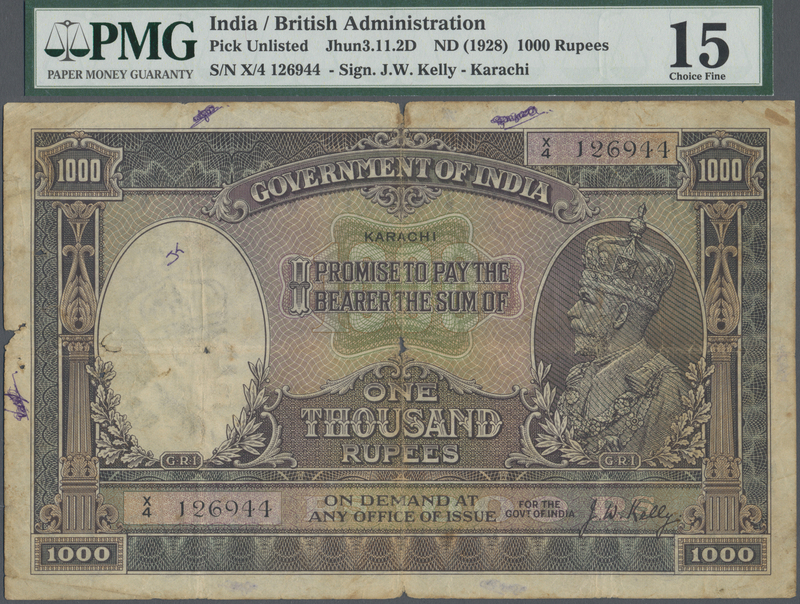 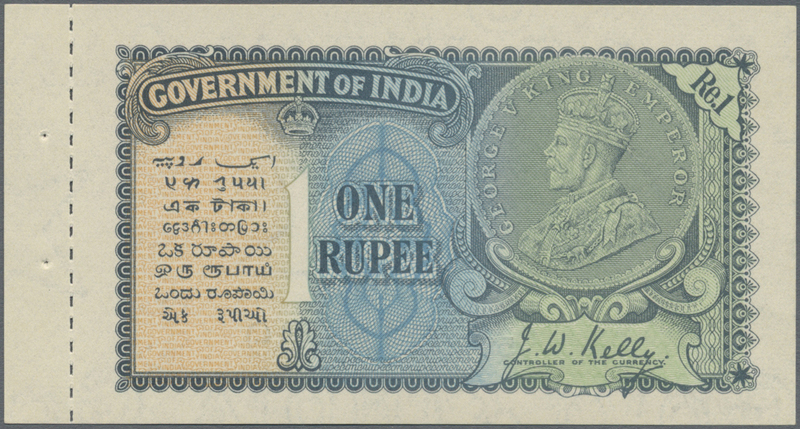 1641 JEWEL of Banknotes INDIA 1,000 Rupees P12 1928 issue extremely rare Only Known banknote in Choice Fine condition with PMG graded #15 signature of J.W.Kelly,bearing the portrait of King George V and Buffalo on back. 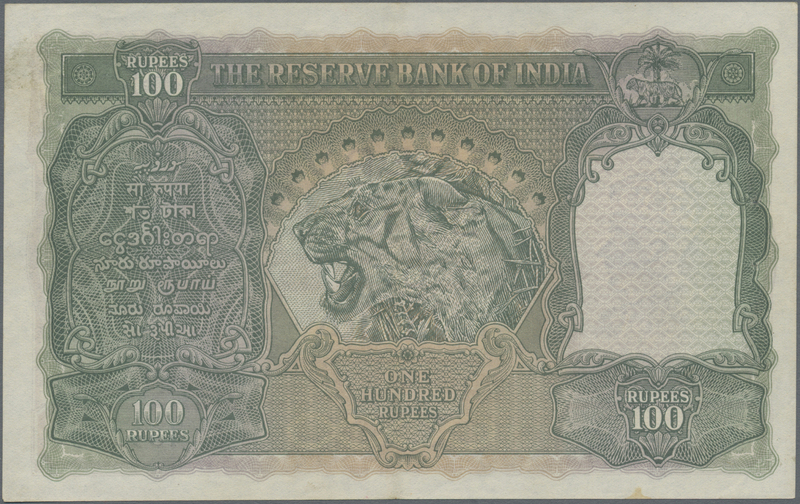 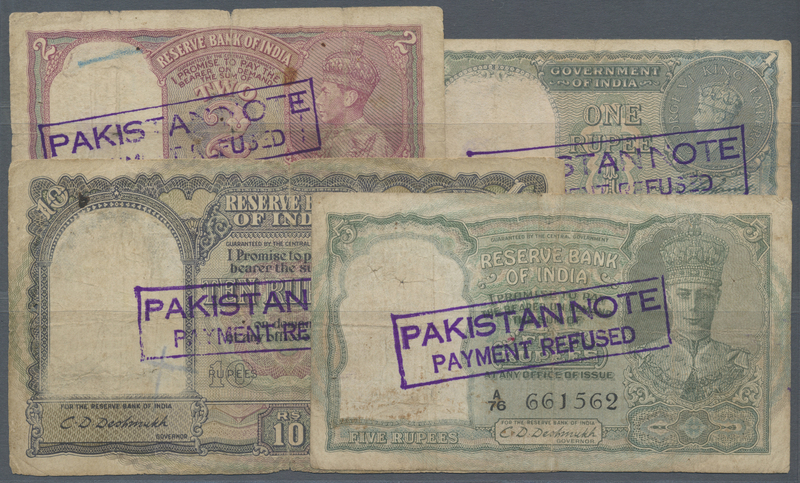 This extremely RARE and only known piece to Exist issued by KARACHI office of the Reserve Bank of India. 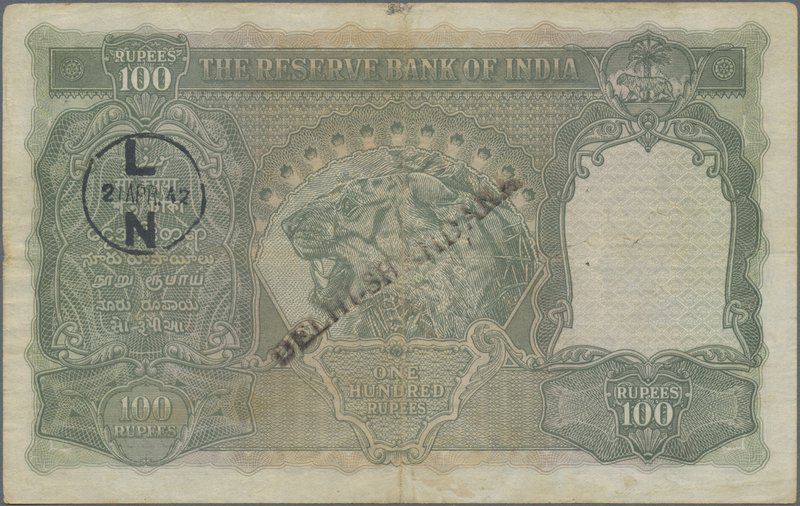 In last 30 years this was the only piece found and know to exist missing in each and every collection of Indian Banknote and that too in this top condition, certified as Never Listed by PMG . 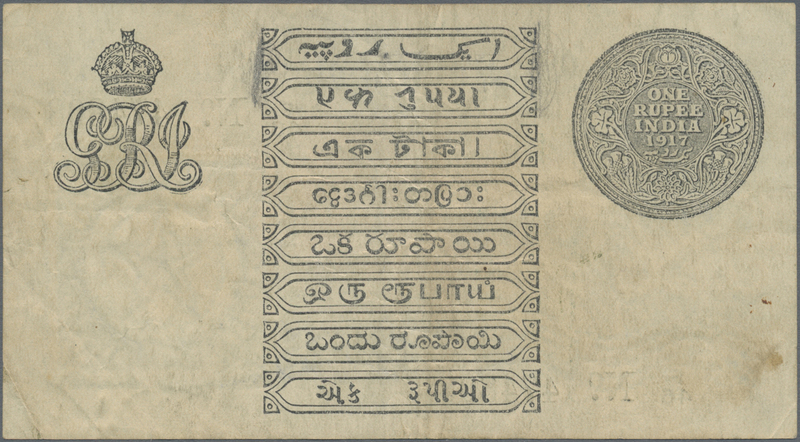 1642 Pick 1a 1 Rupee ND P. 1a, used with lighter vertical and horizontal folds, no holes or tears, still strongness in paper in condition: VF-. 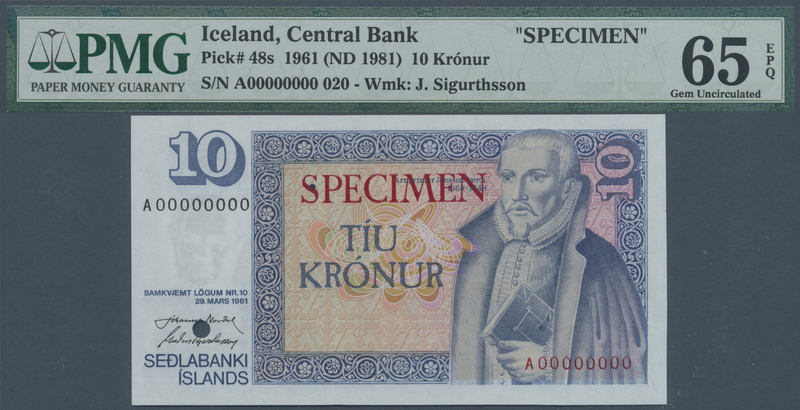 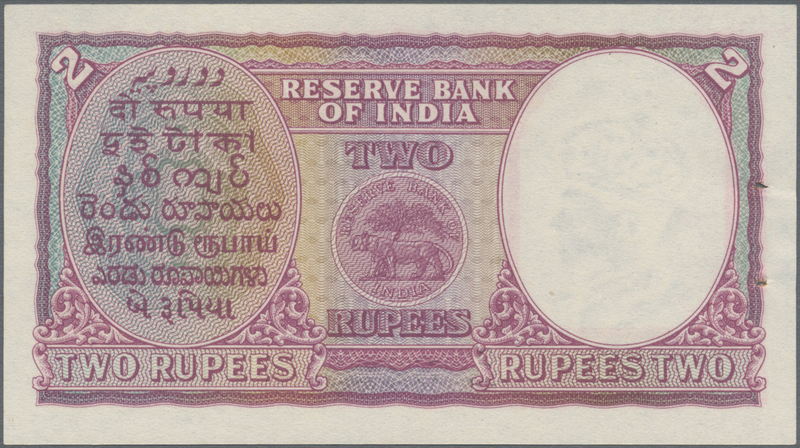 1643 Pick 1c 1 Rupee ND P. 1c, sign. 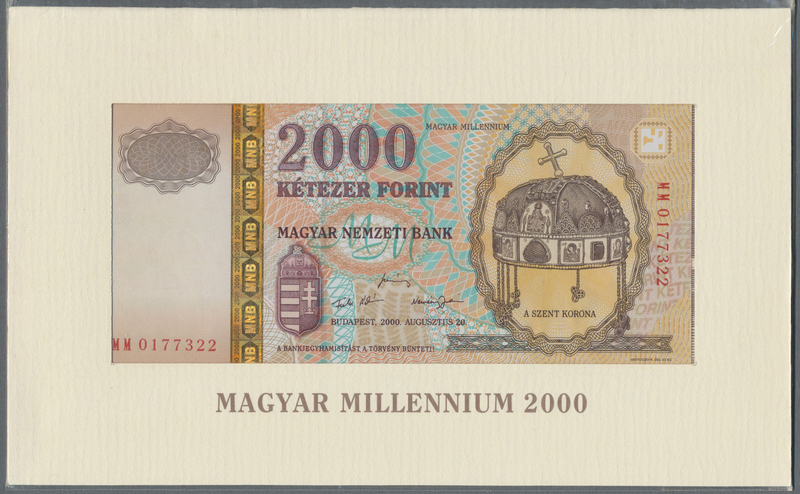 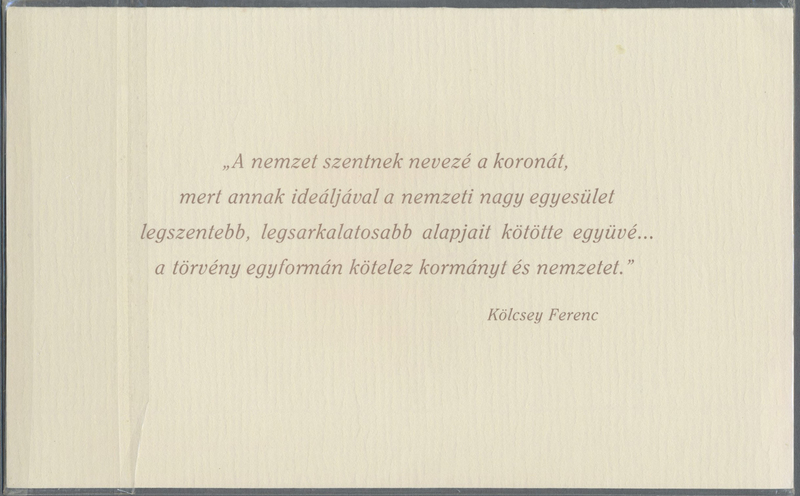 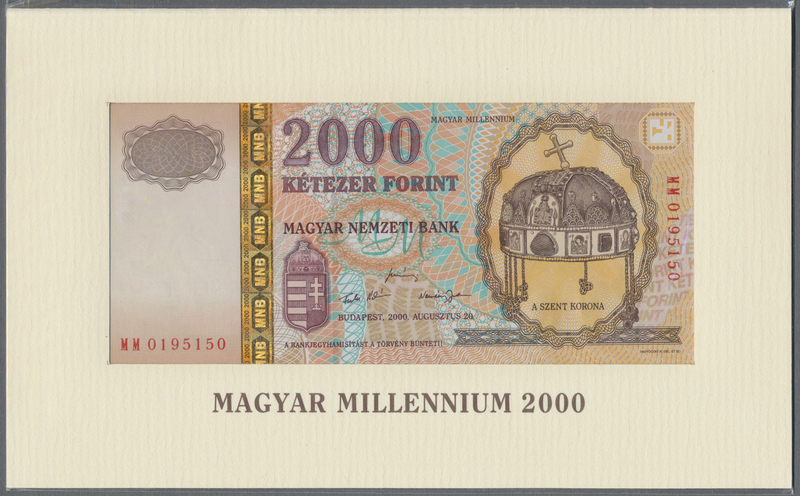 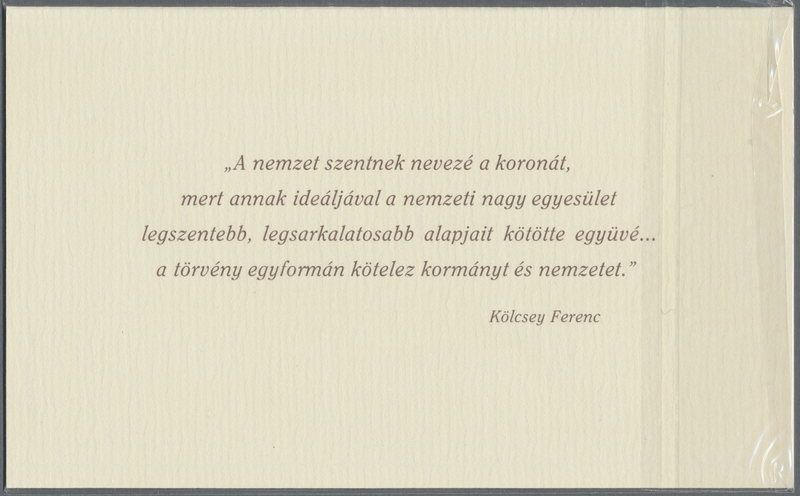 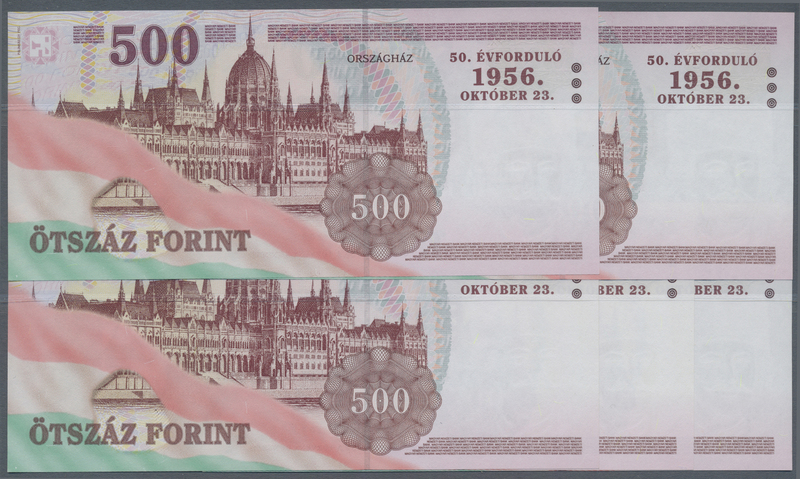 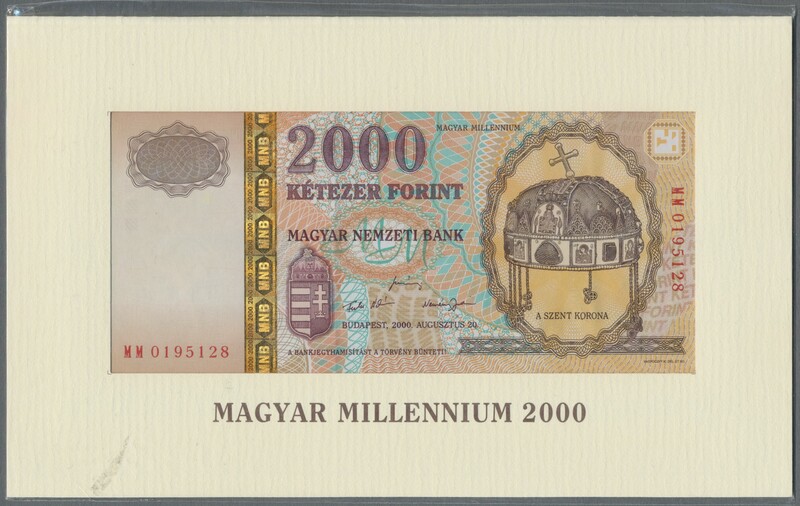 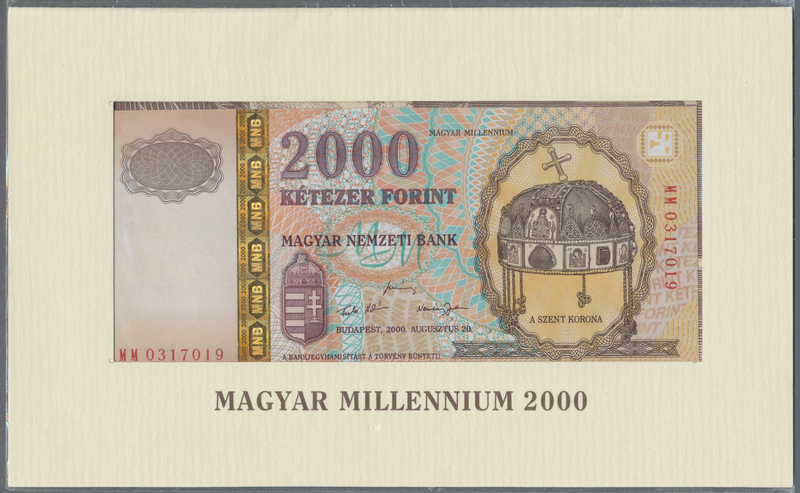 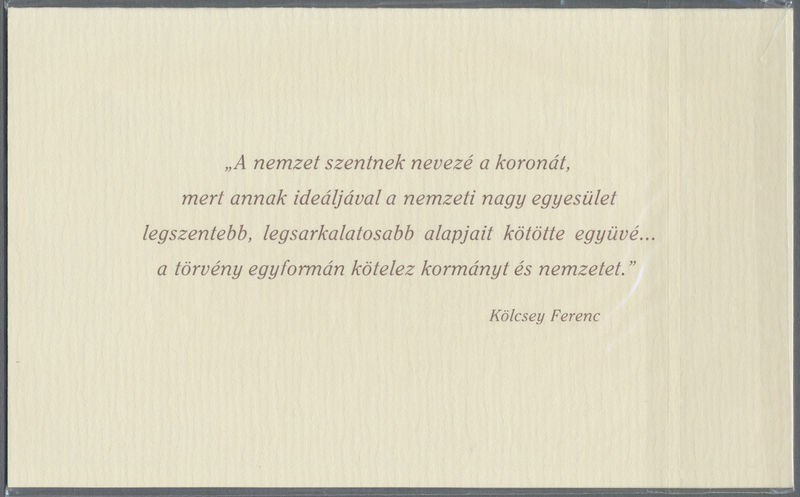 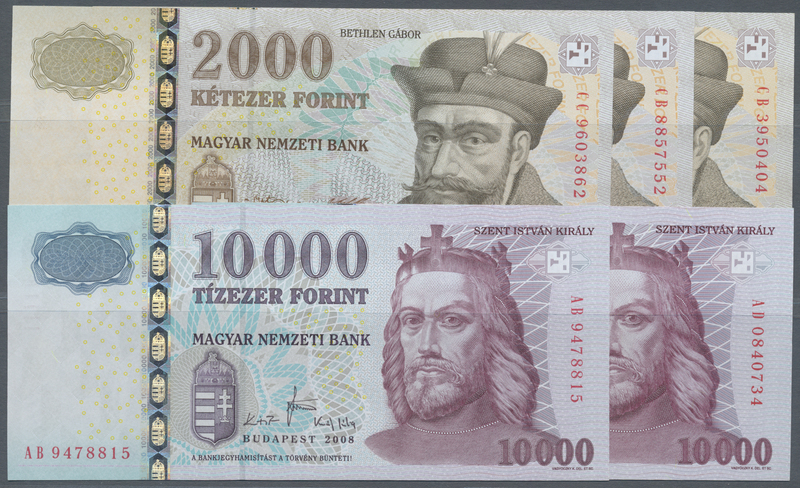 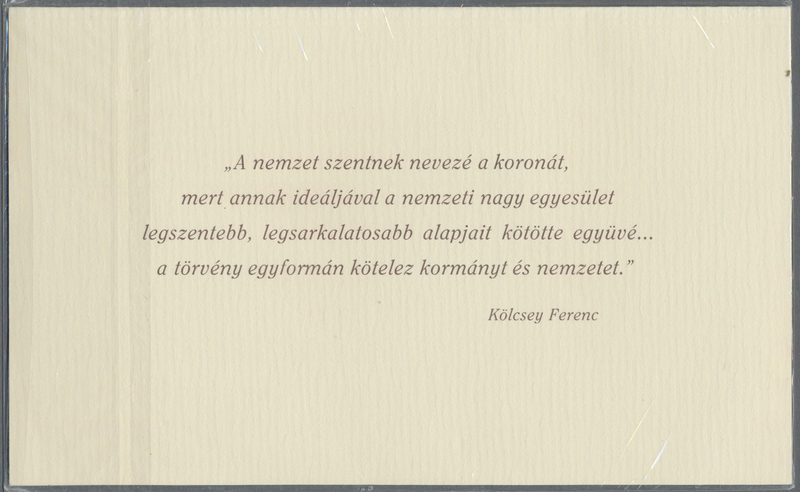 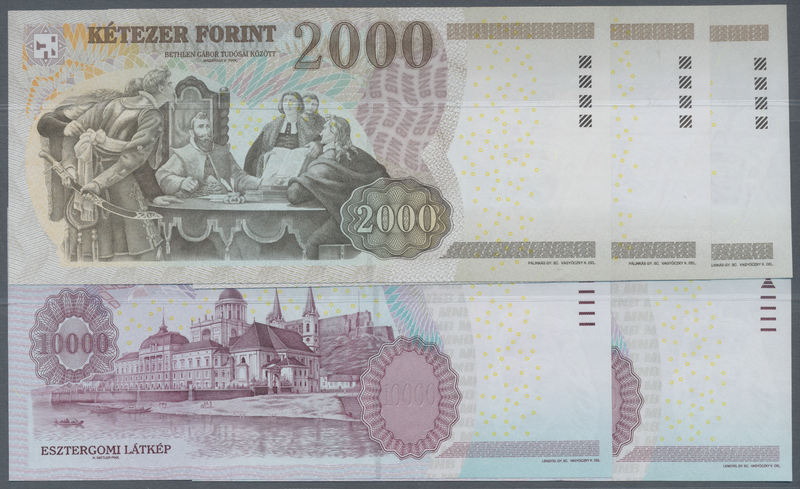 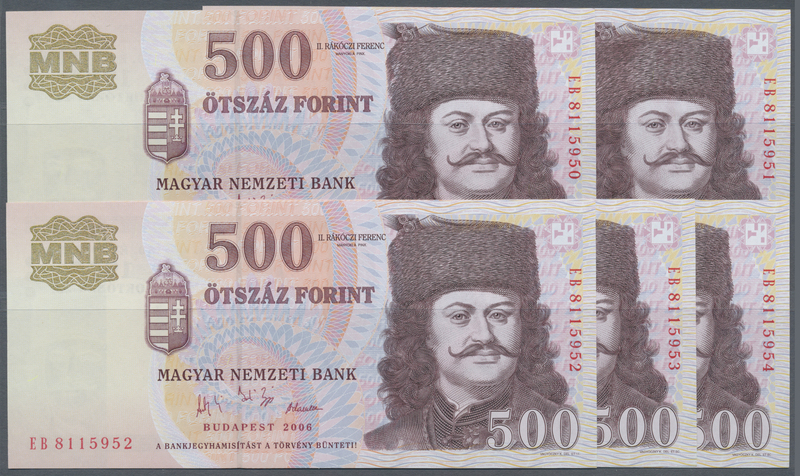 Denning with light horizontal and vertical folds in paper, no holes or tears, paper still crisp and original, nice colors, not washed or pressed, condition: VF to VF+. 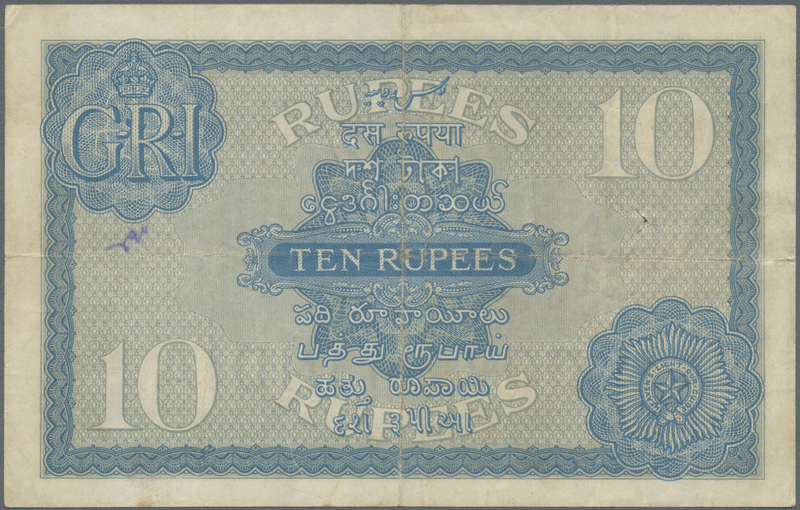 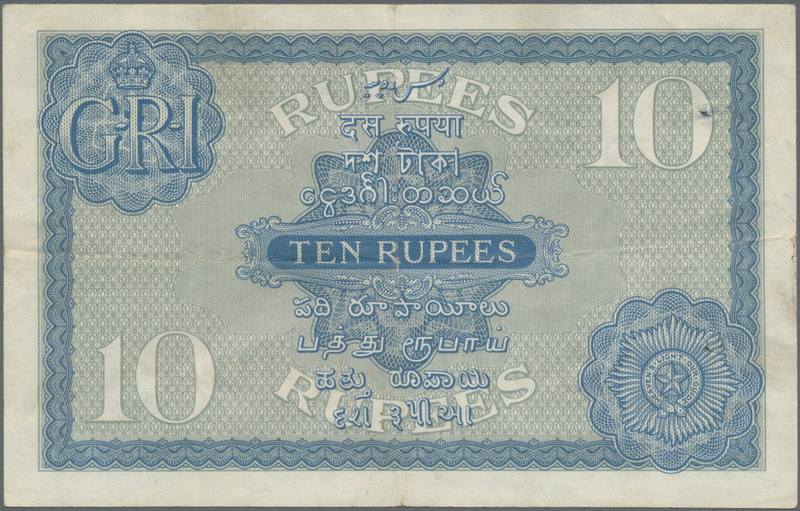 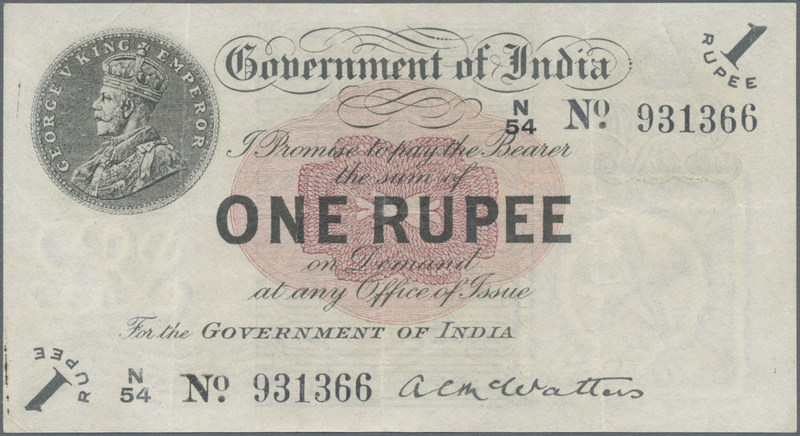 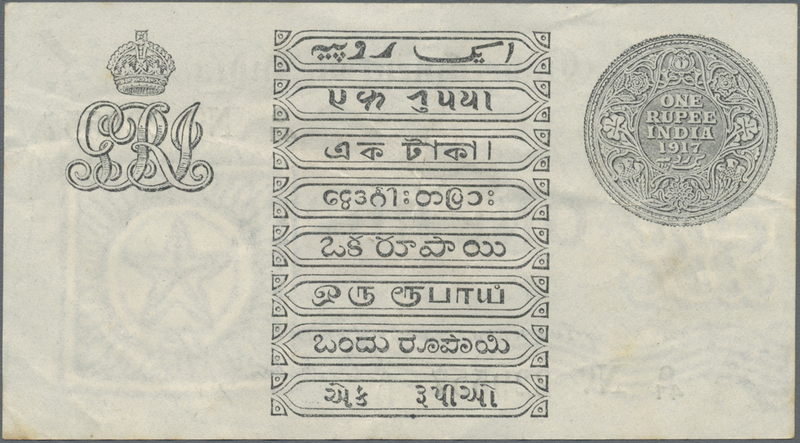 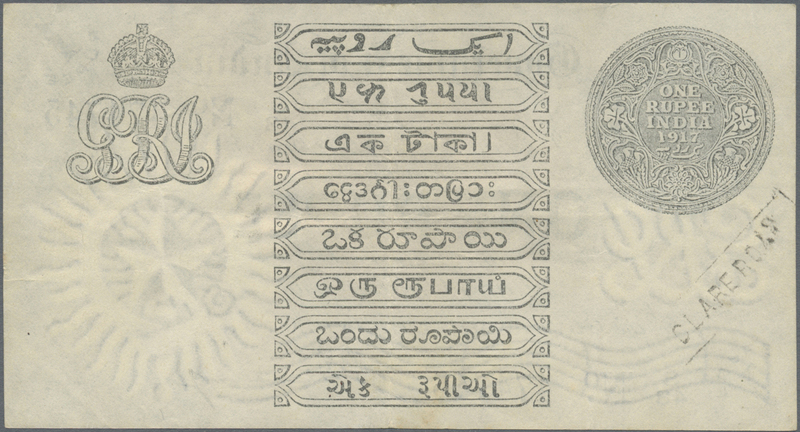 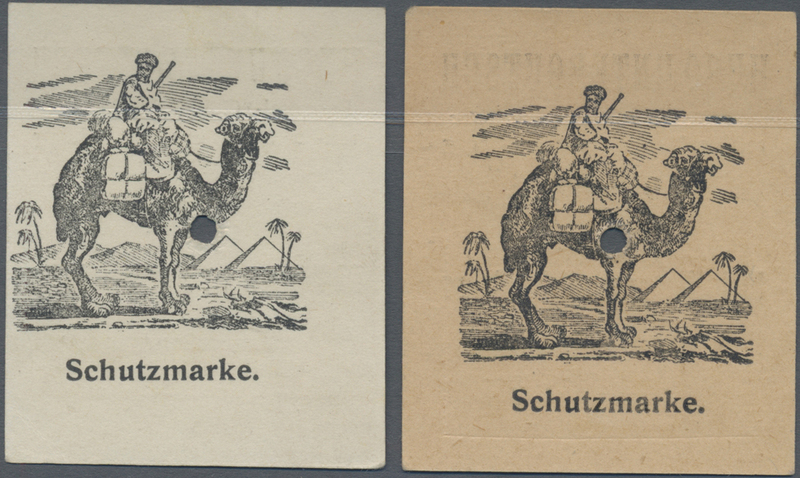 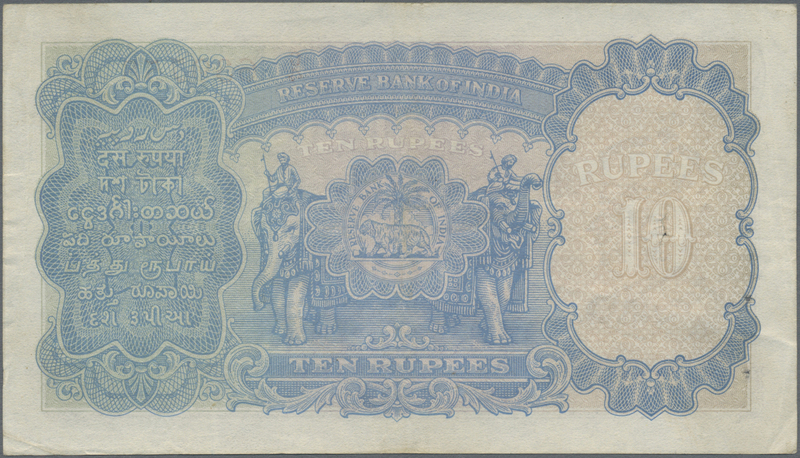 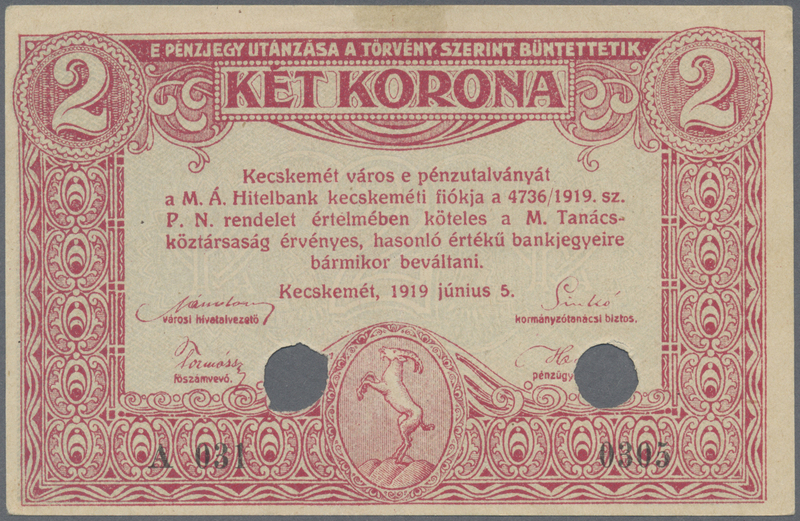 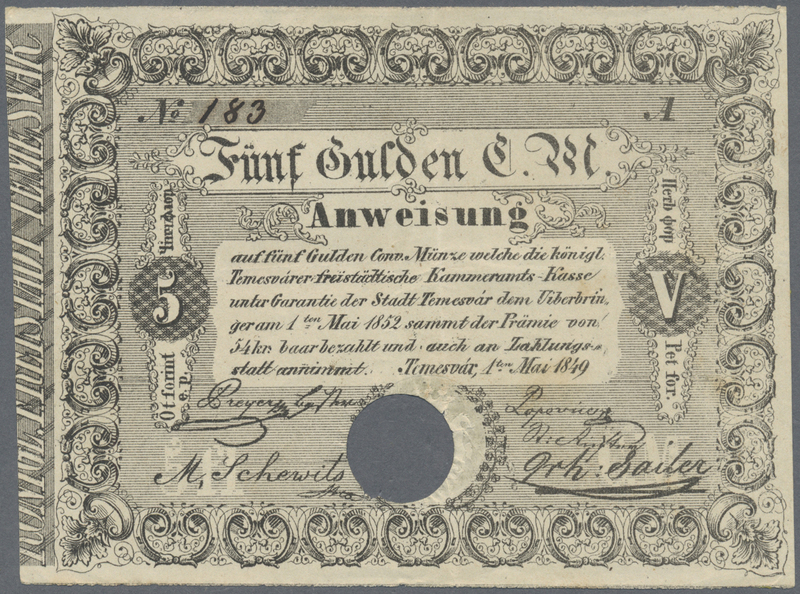 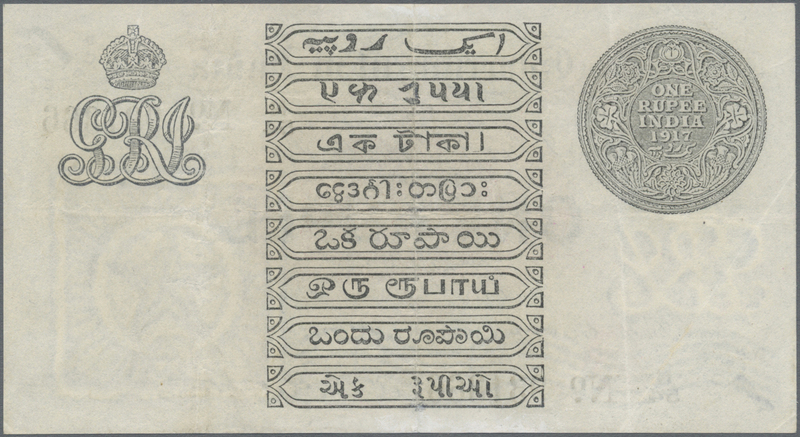 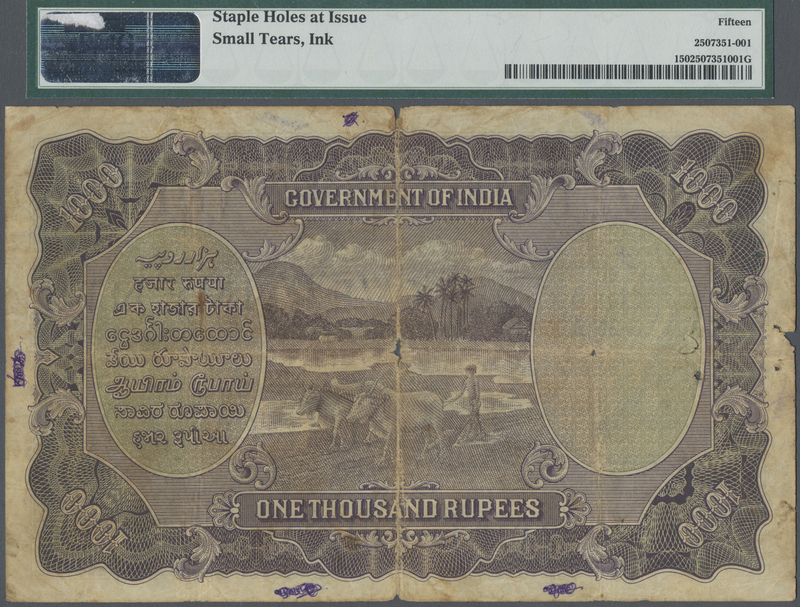 1644 Pick 1e 1 Rupee 1917 P. 1e, used with vertical folds, probably pressed dry, no holes or tears, still strong paper, condition: VF. 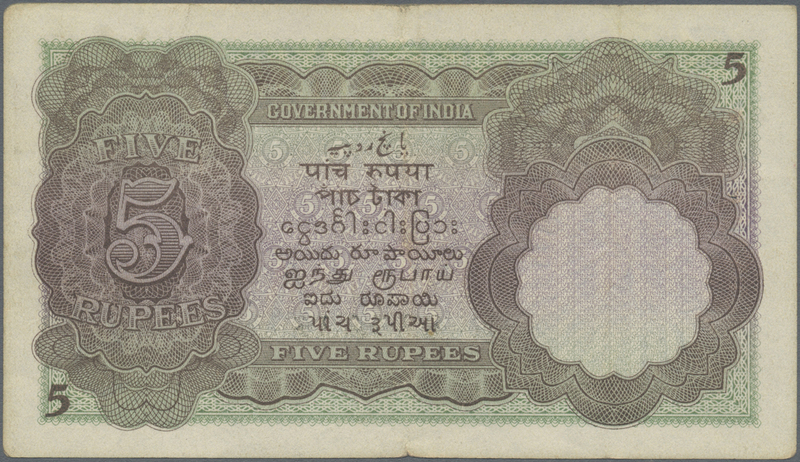 1645 Pick 1g 1 Rupee ND sign. 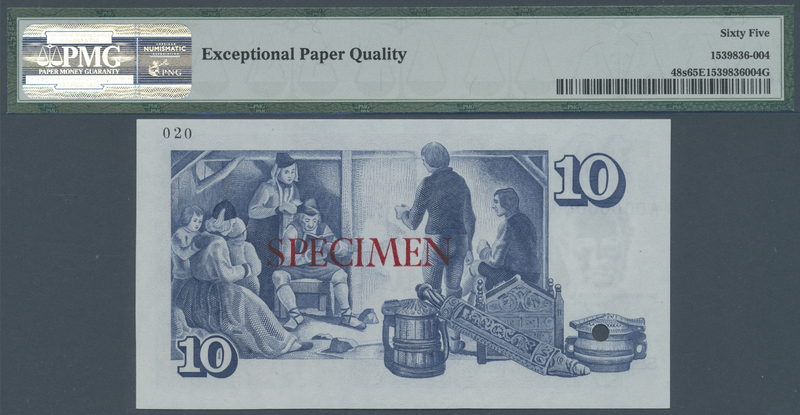 Gubbay P. 1g, only lightly used with light folds in paper, no holes or tears, still very crisp original paper and original colors, condition: XF. 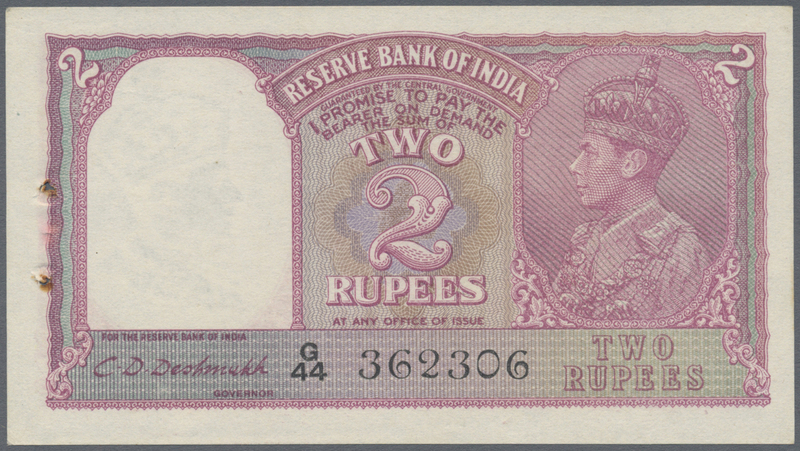 1646 Pick 7a 10 Rupees ND portrait KGV P. 7a in lightly used condition, with vertical and horizontal folds, larger usual pinhole at left in watermark area, nice colors, not washed or pressed, condition: VF. 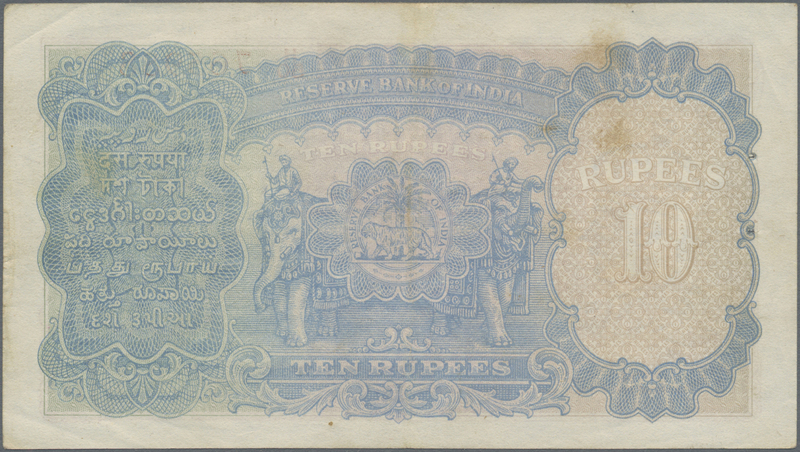 1648 Pick 7b 10 Rupees ND P. 7b, used with vertical and horizontal fold, 2 pinholes at left, crispness in paper, not washed or pressed, still original colors, no repairs, condition: VF to VF+. 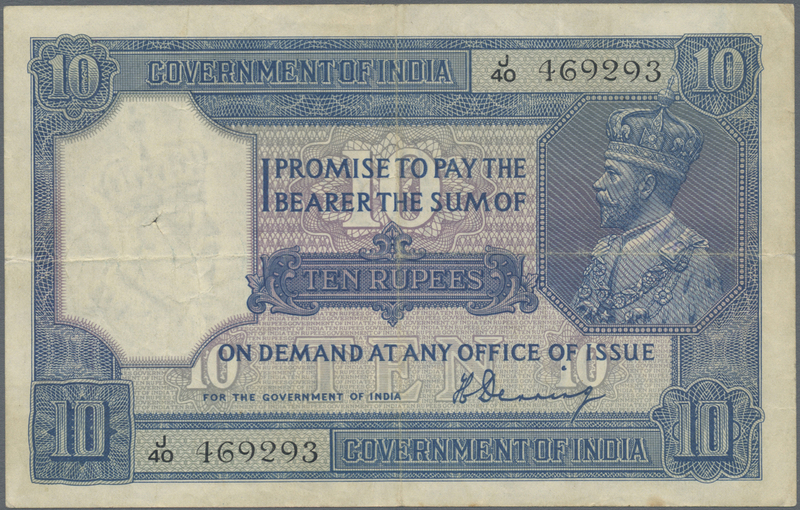 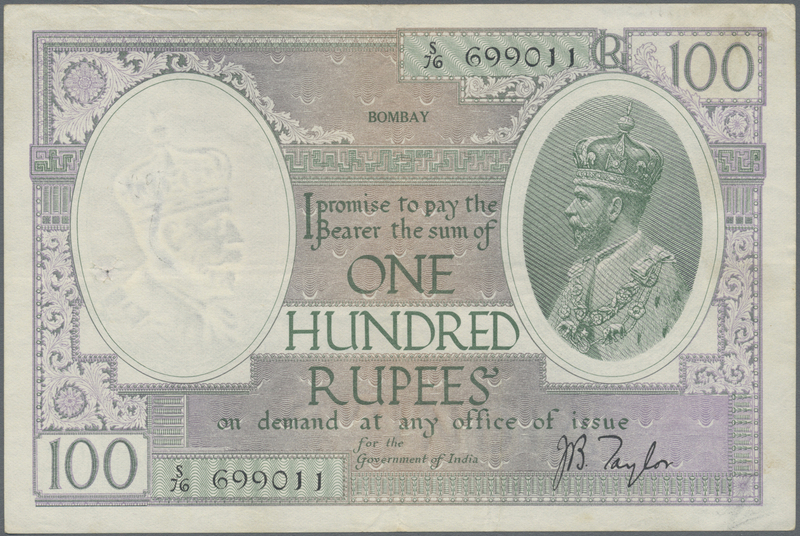 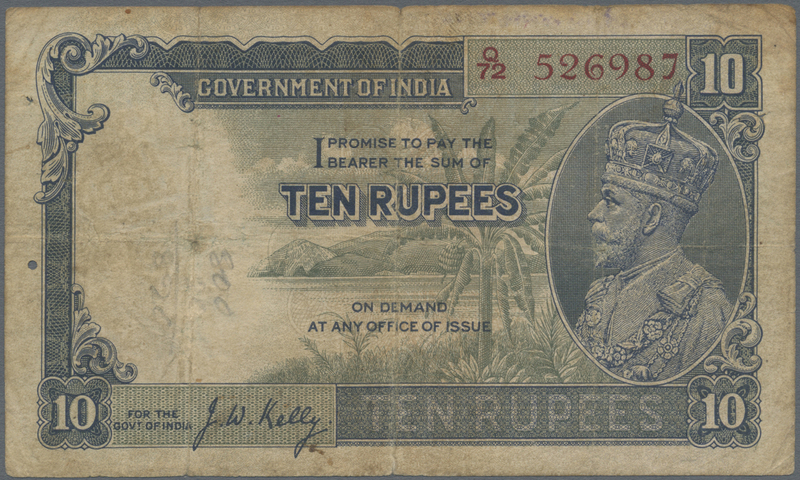 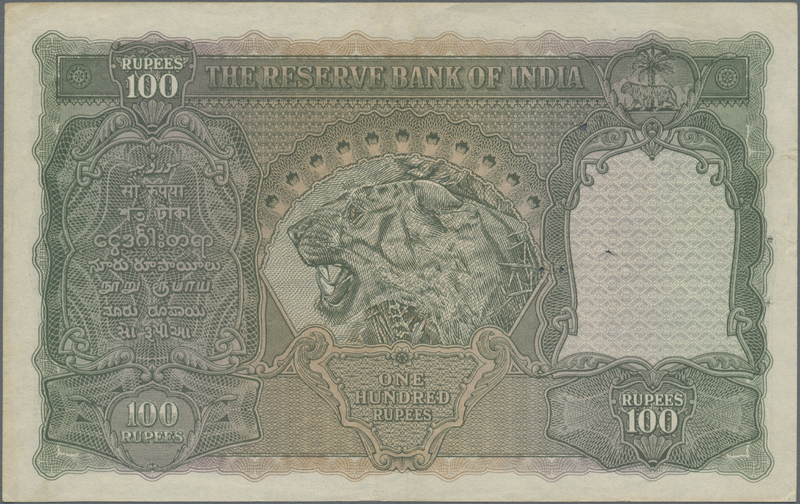 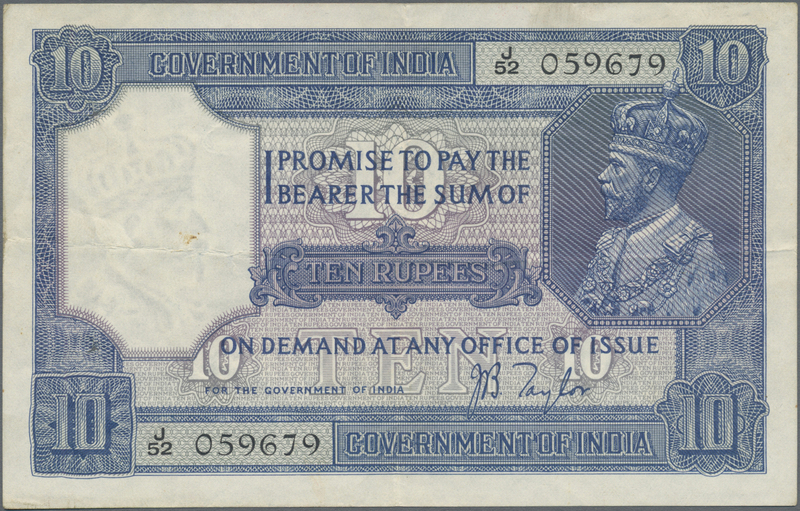 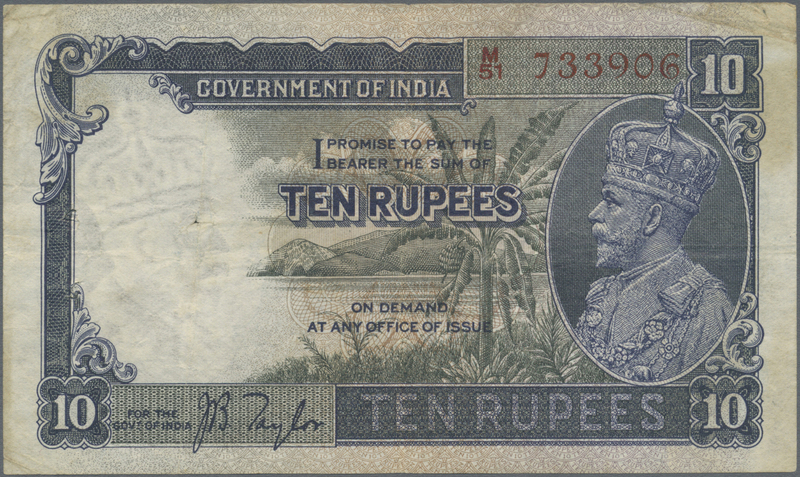 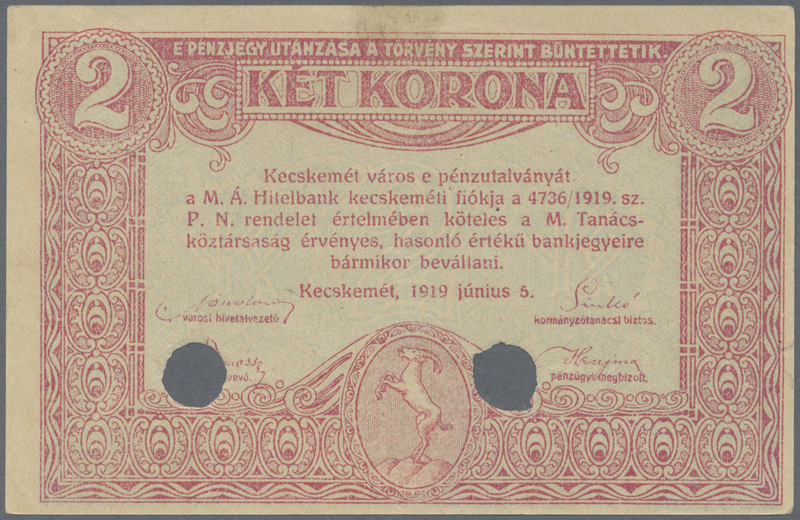 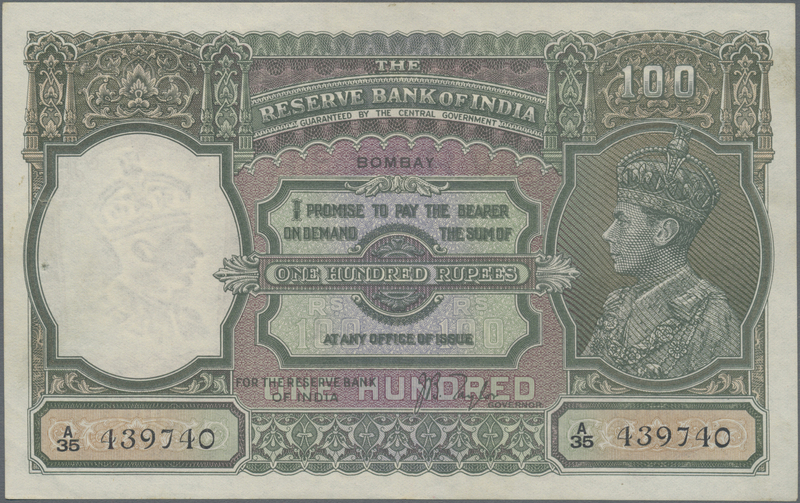 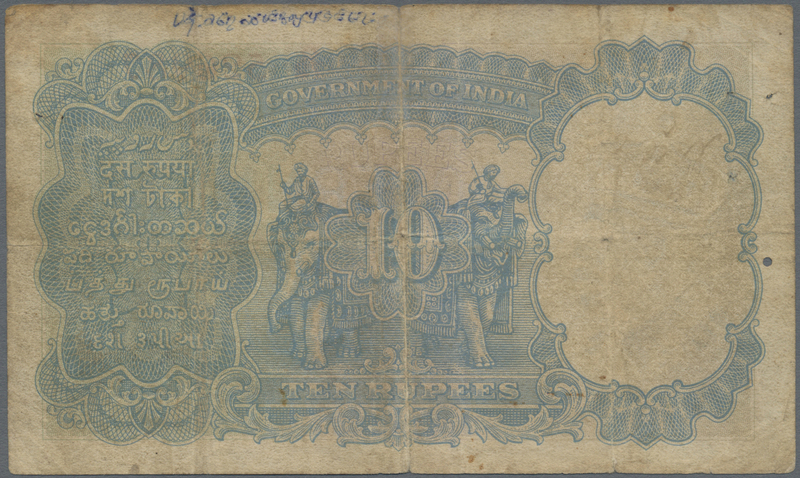 1649 Pick 10b 100 Rupees 1930 P. 10b issued in BOMBAY, used with light vertical and horizontal folds in paper, one usual larger pinhole at left, no repairs, still strong paper and original colors, erased date at upper border on back side, conditoin: VF+. 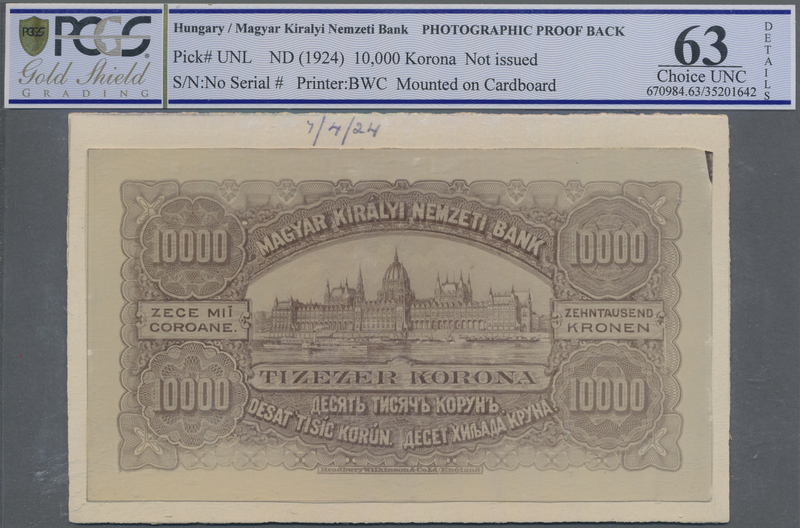 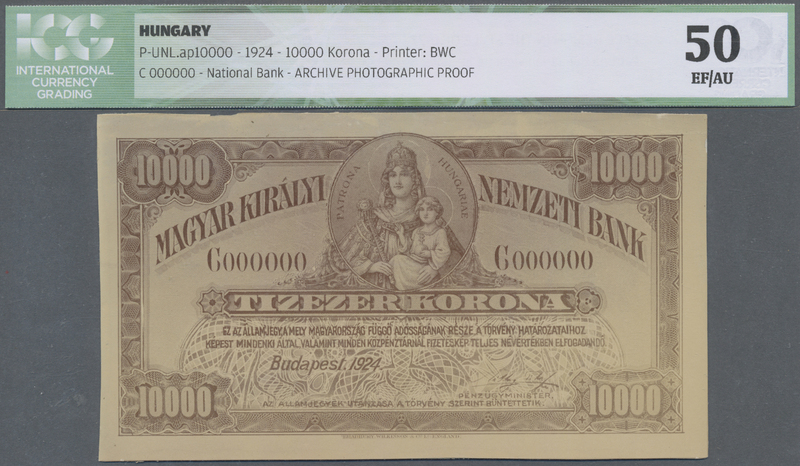 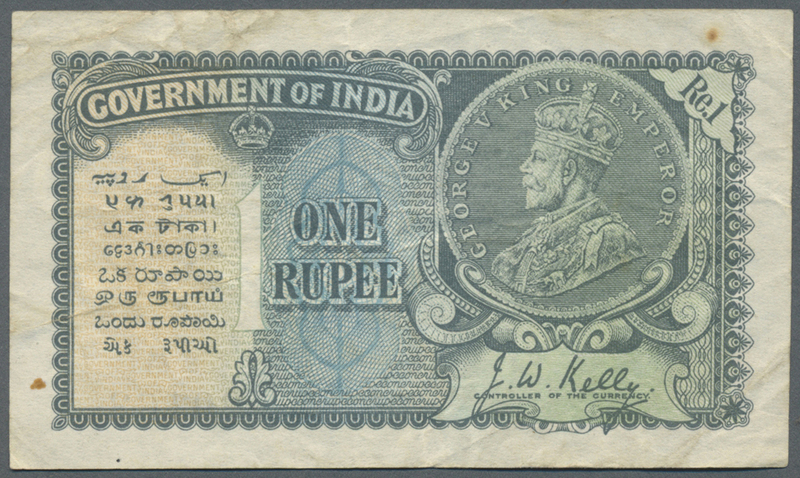 1650 Pick 14a 1 Rupee ND portrait KGV P. 14a in stronger used condition with strong folds and stain in paper, in condition: VG+ to F-. 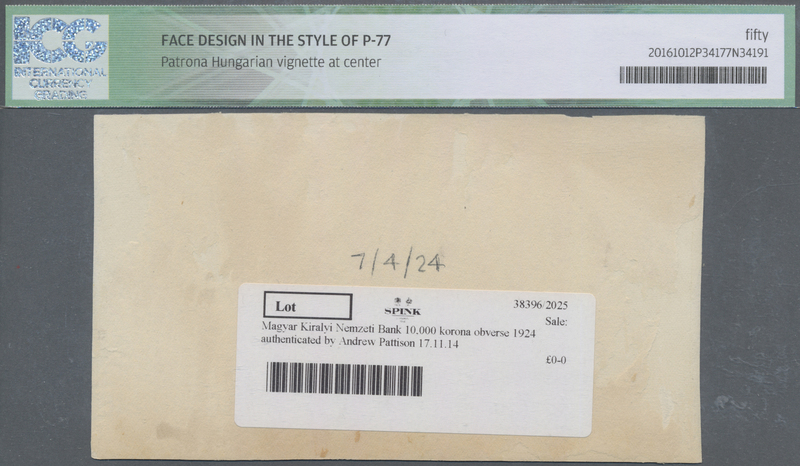 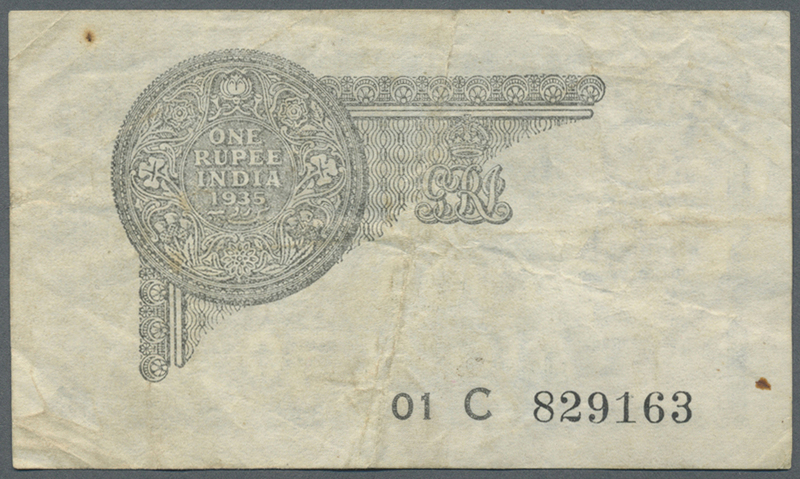 1652 Pick 14b 1 Rupee ND portrait KGV P. 14b with counterfoil in original condition: UNC. 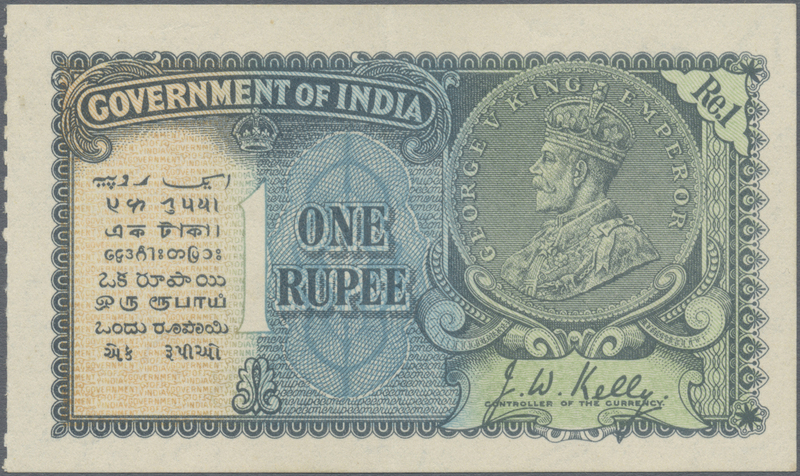 1653 Pick 14b 1 Rupee ND P. 14b, portrait KGV, with three light vertical bends, no holes or tears, very crisp original paper, original colors, no holes or tears, not washed or pressed, condition: XF to XF+. 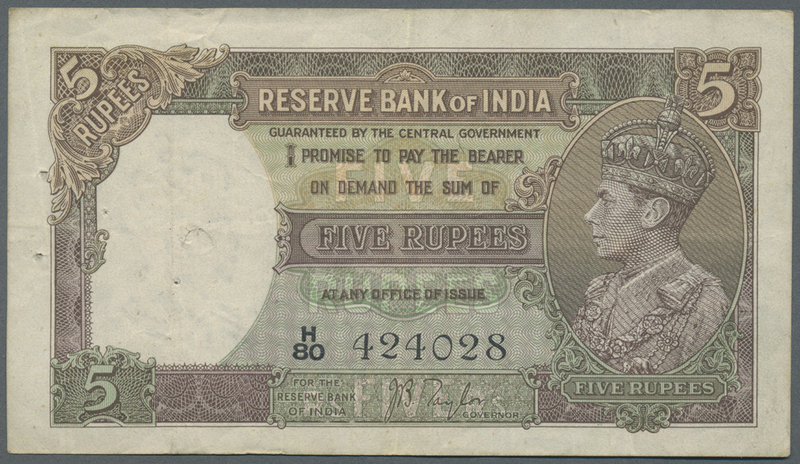 1654 Pick 15a 5 Rupees ND portrait KGV P. 15a, used with folds and creases, pinholes, no repairs, condition: F+ to VF-. 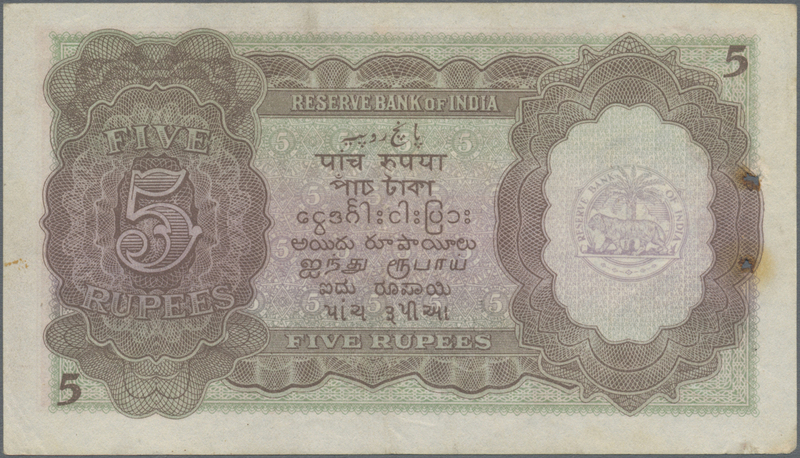 1655 Pick 15b 5 Rupees ND(1928-35) P. 15b, light folds in paper, rounded corners, 2 pinholes, still strong paper and nice colors, condition: VF to VF+. 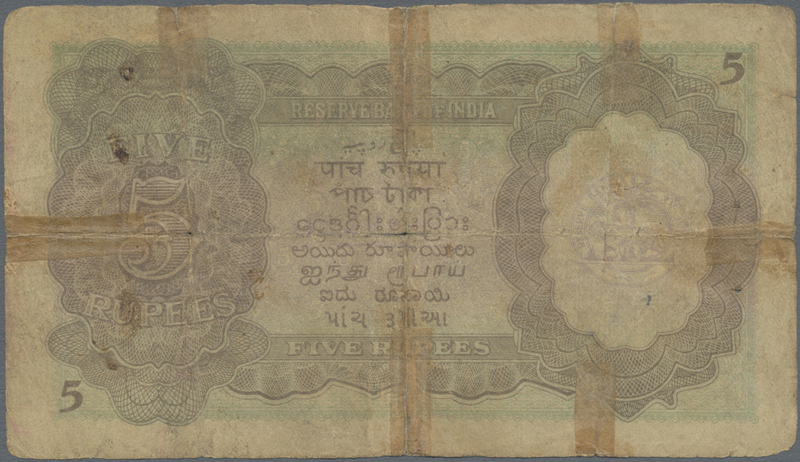 1656 Pick 16a 10 Rupees ND sign. 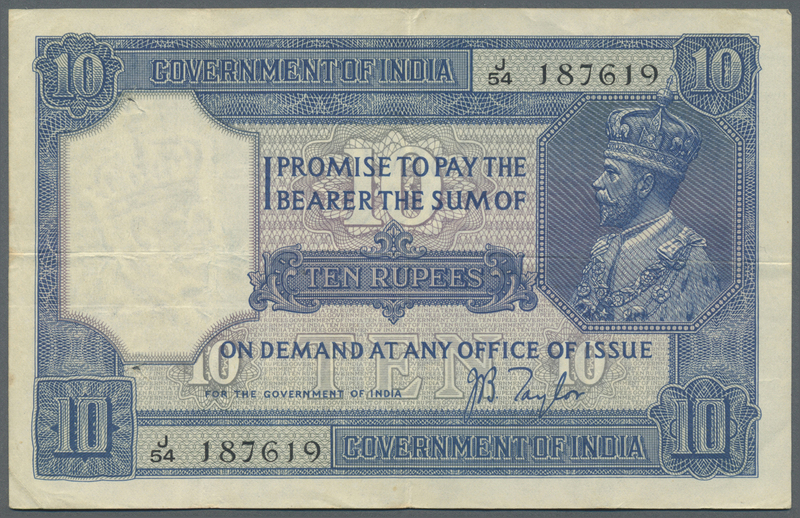 Taylor, portrait KGV P. 16a, used with several folds in paper, some light stain traces in paper, pinholes, original colors, no repairs, condition: VF. 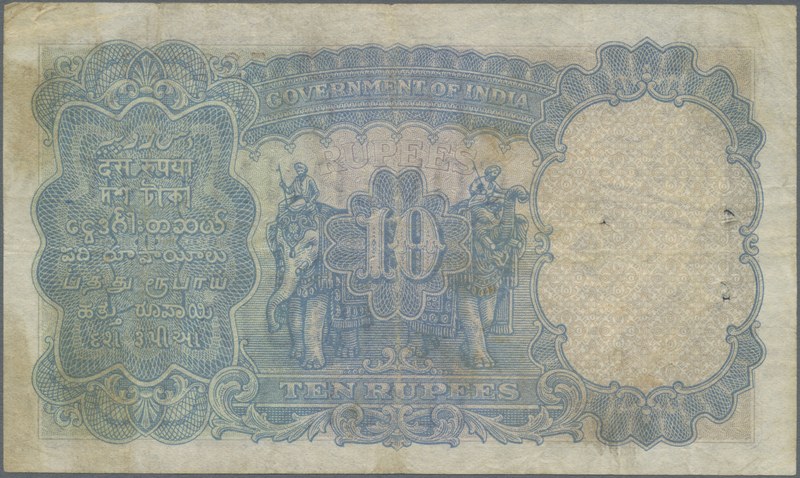 1657 Pick 16b 10 Rupees ND(1928-32) P. 16b, stronger used with strong folds, writings and stain in paper, pinholes, but no repairs, condition: F-. 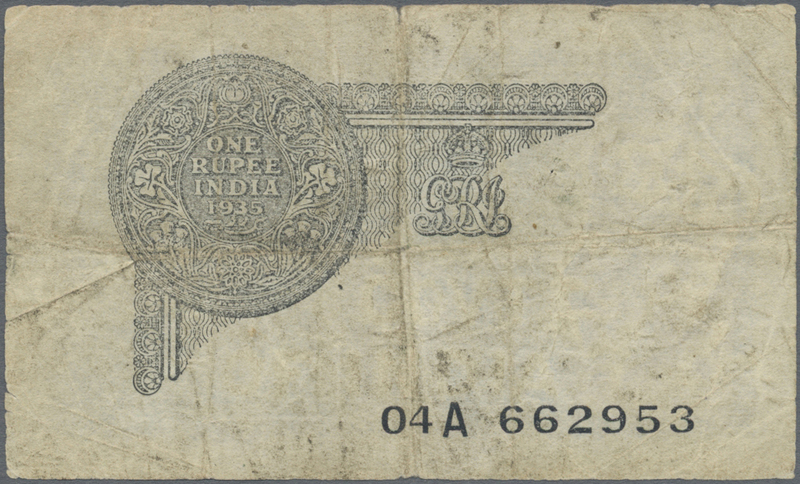 1658 Pick 17 2 Rupees ND(1943) P. 17b, rarely seen with RED TYPE serial number, used with folds and stain in paper, pinholes, conditoin: F-. 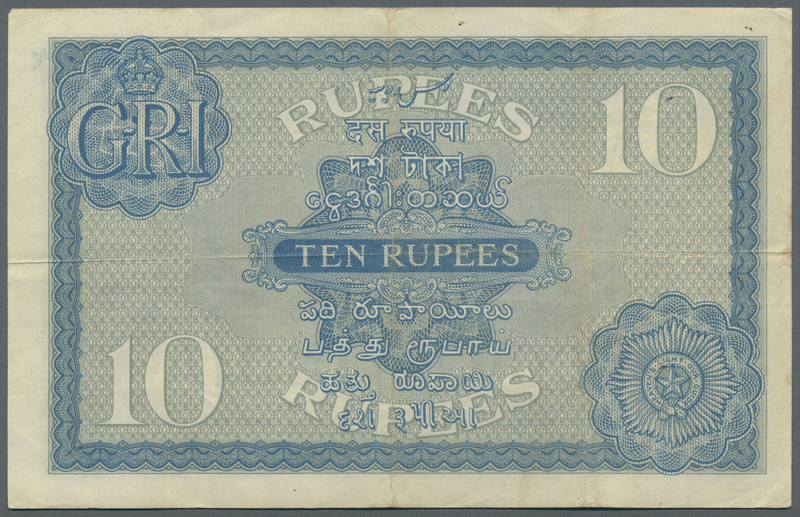 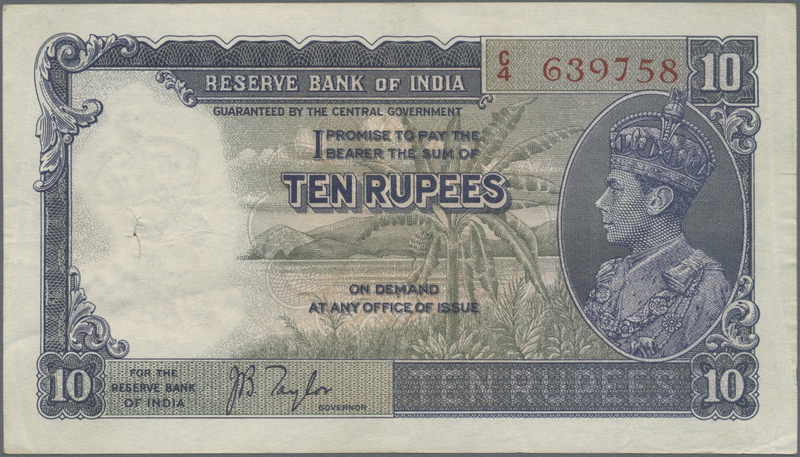 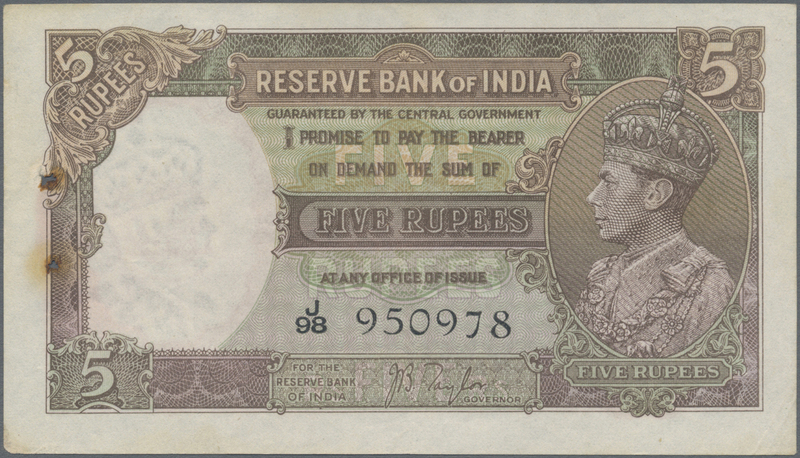 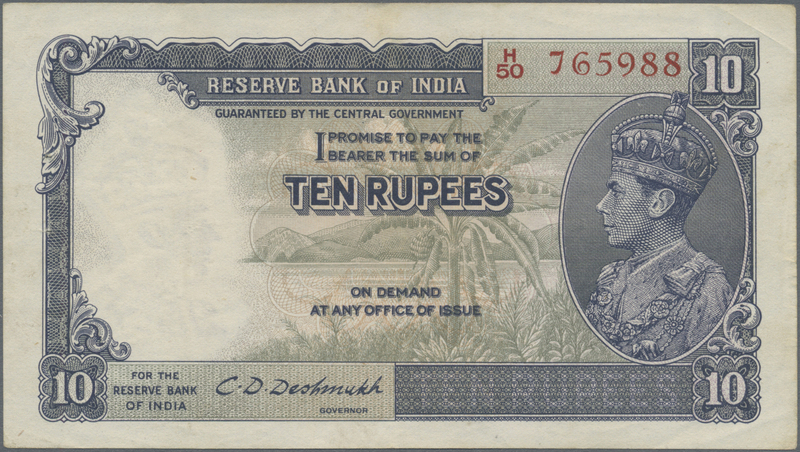 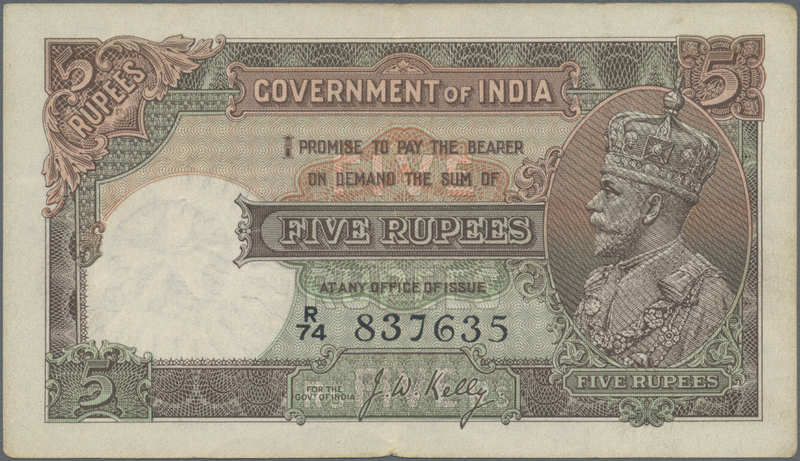 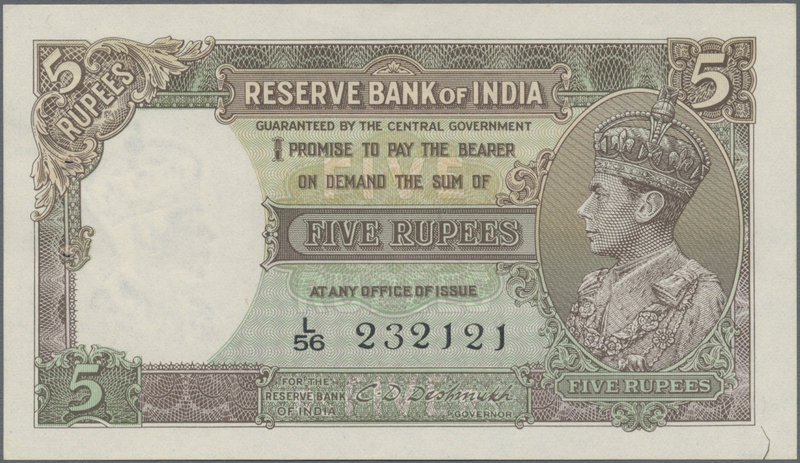 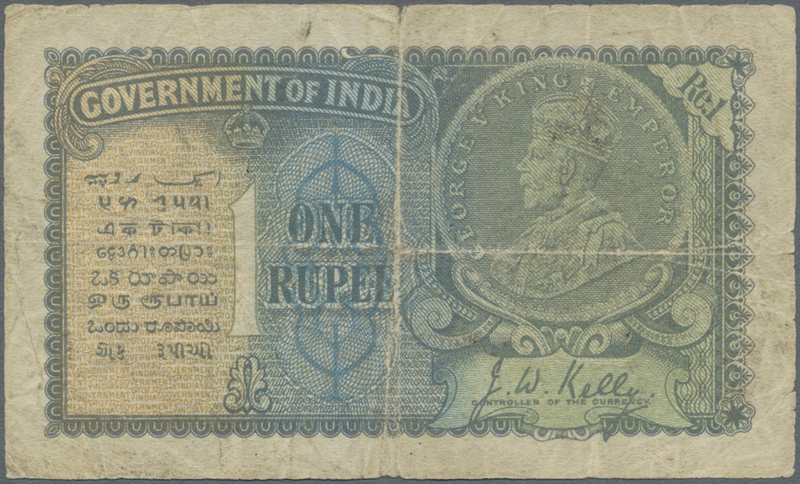 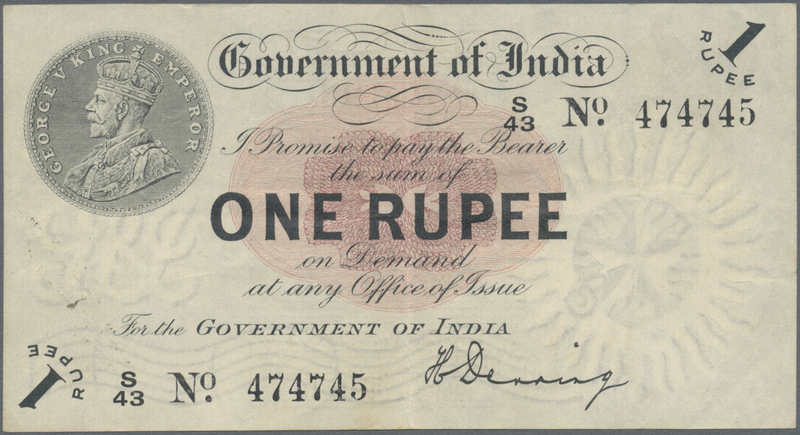 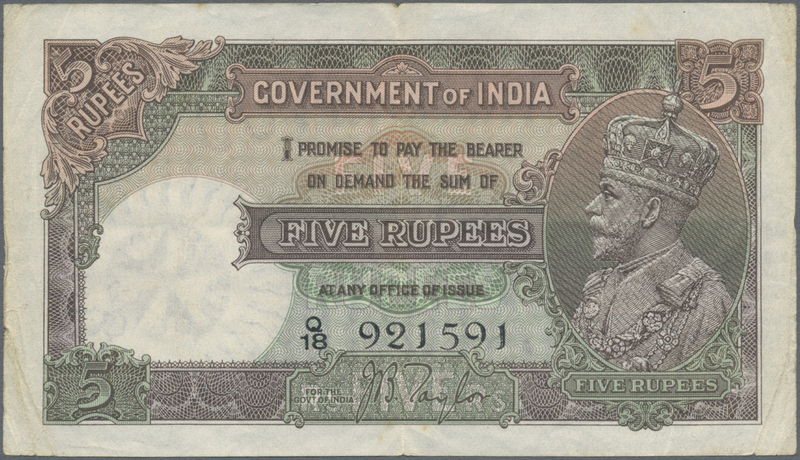 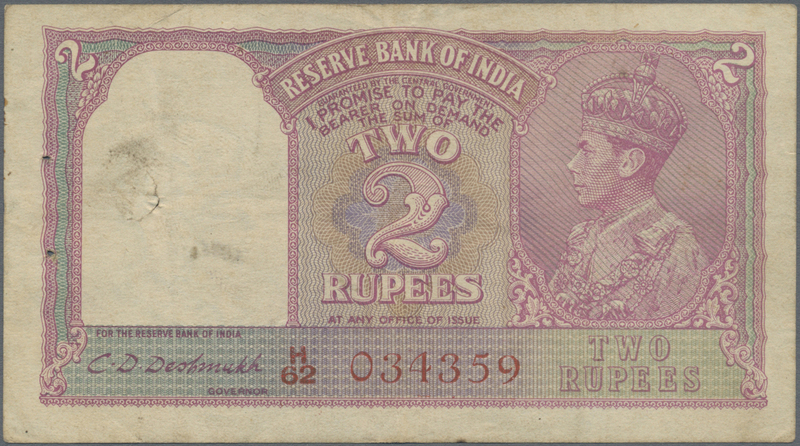 1659 Pick 17a 2 Rupees ND(1937) P. 17a, sign. 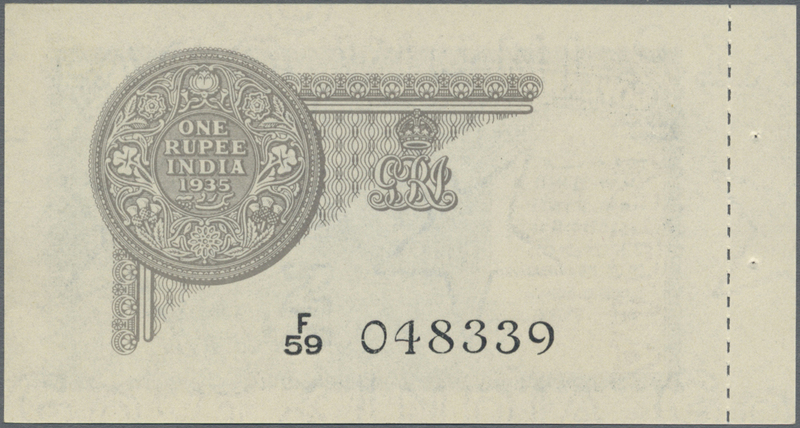 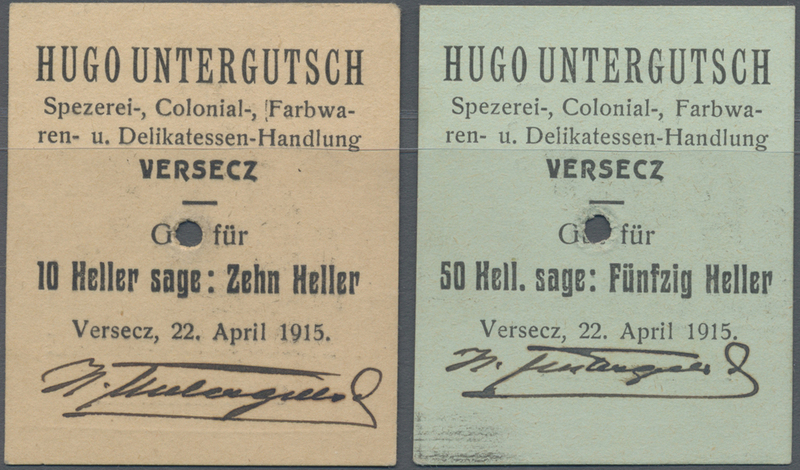 Taylor, with 2 light vertical bends, minor stain trace at lower border, 2 pinholes in condition: XF+. 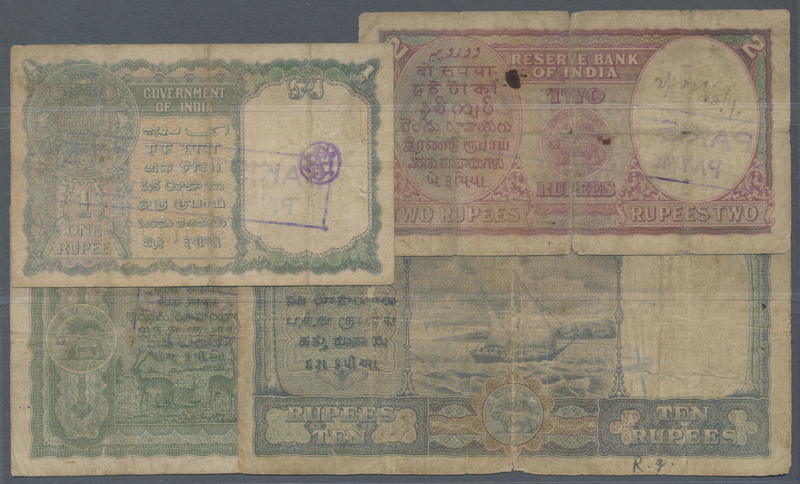 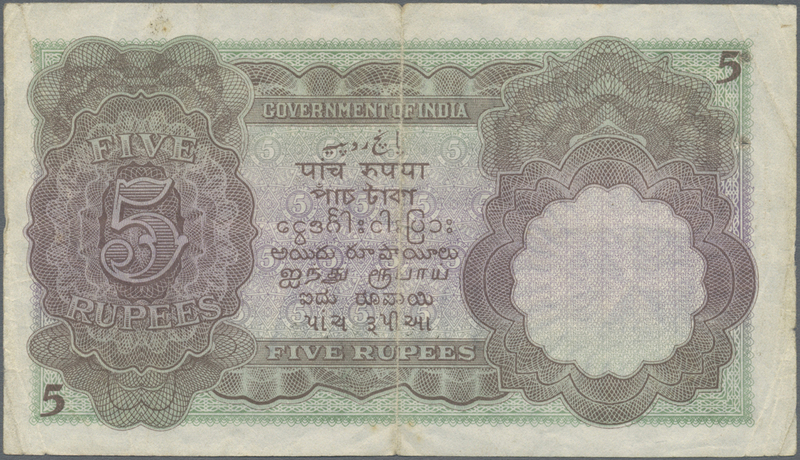 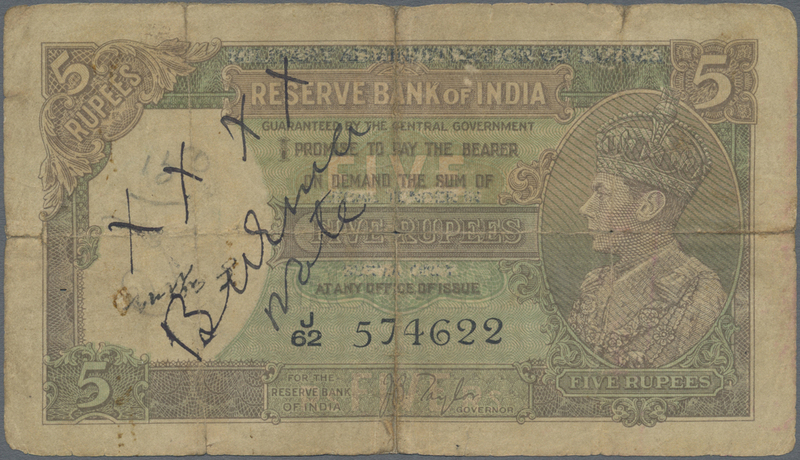 1660 Pick 17b 2 Rupees ND(1943) P. 17b, sign. 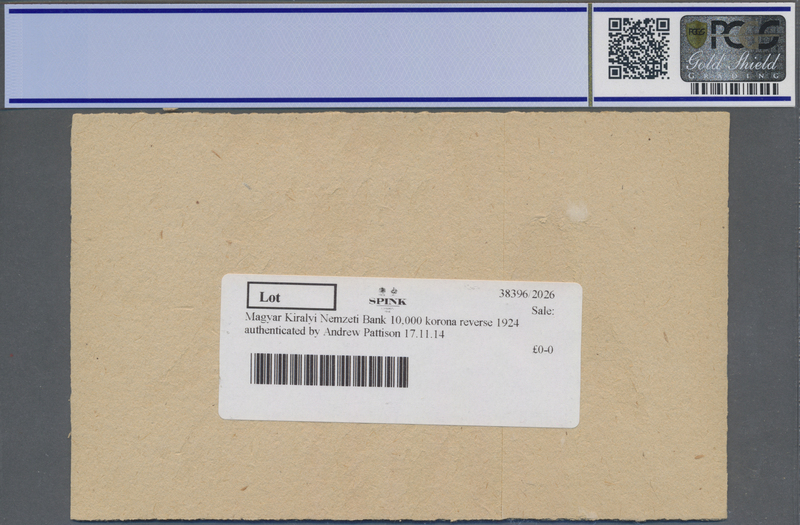 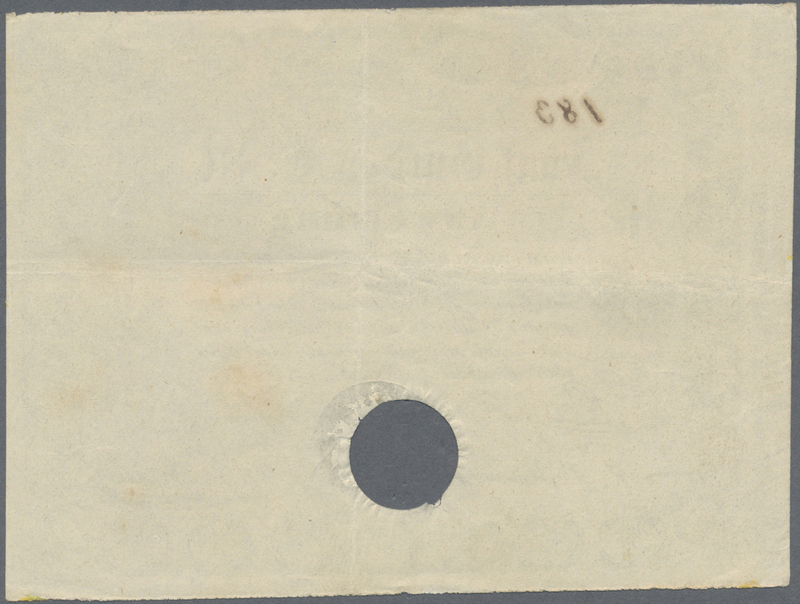 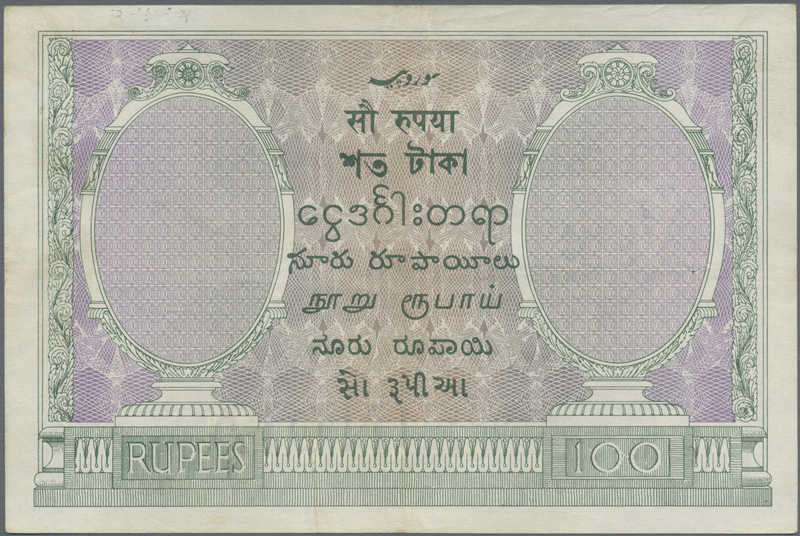 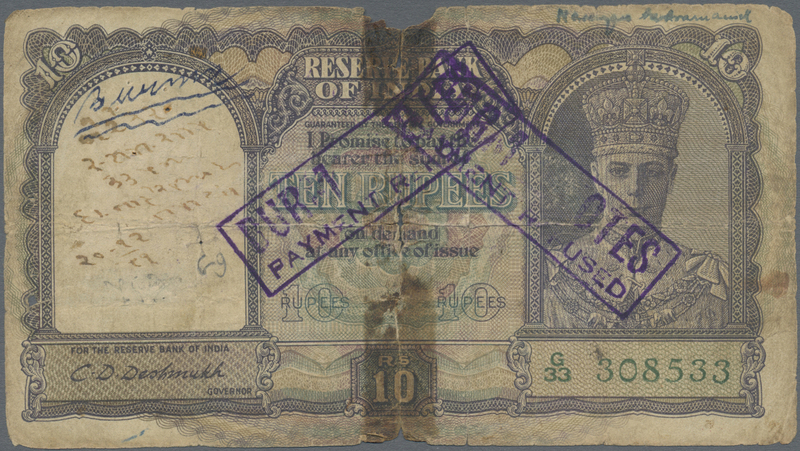 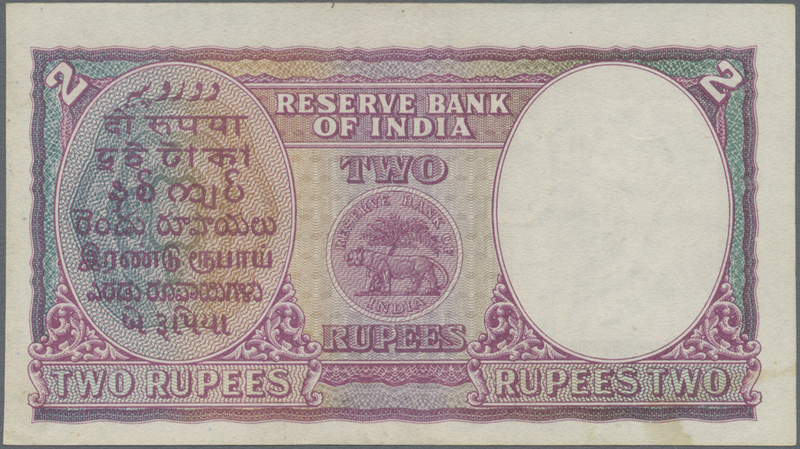 Deshmukh, crisp paper, 2 pinholes in condition: aUNC/UNC. 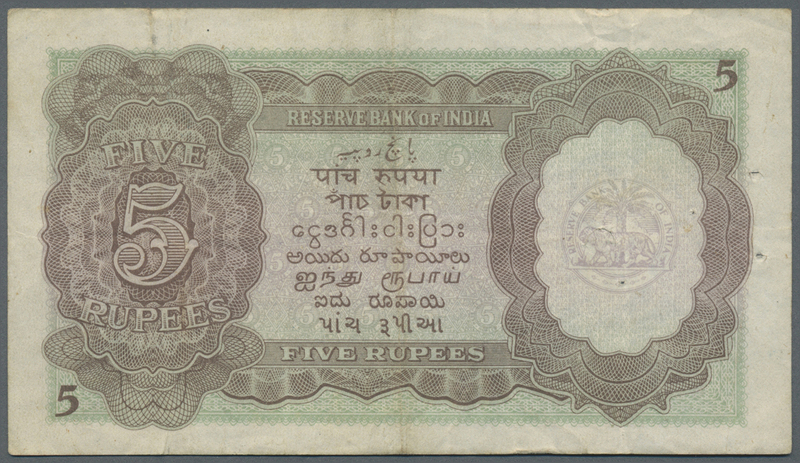 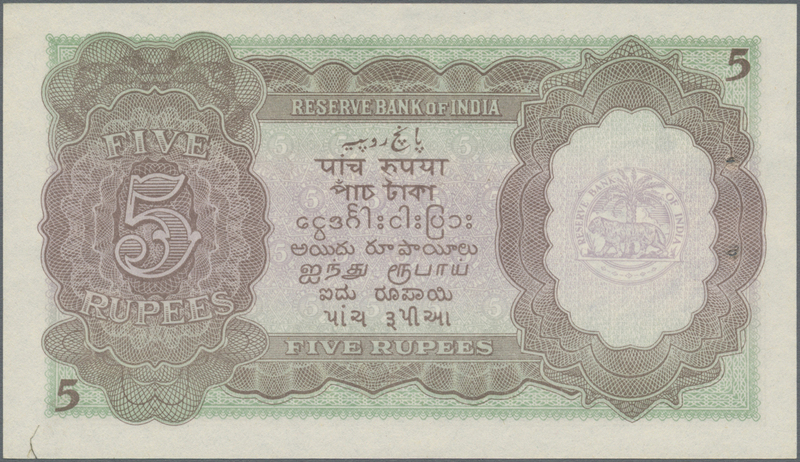 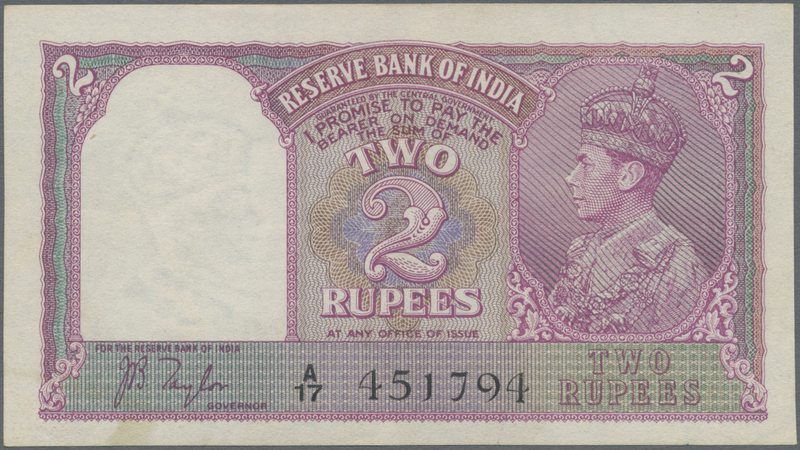 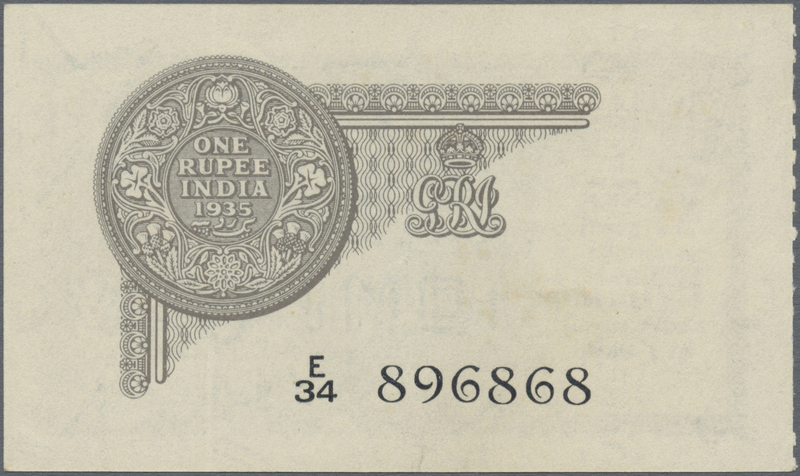 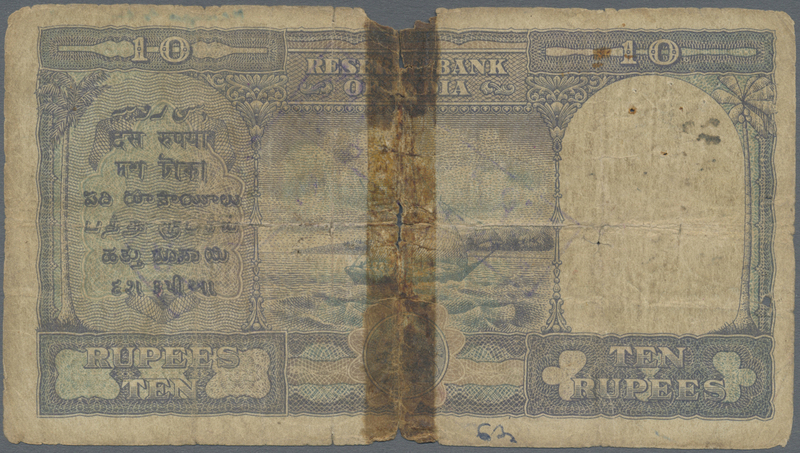 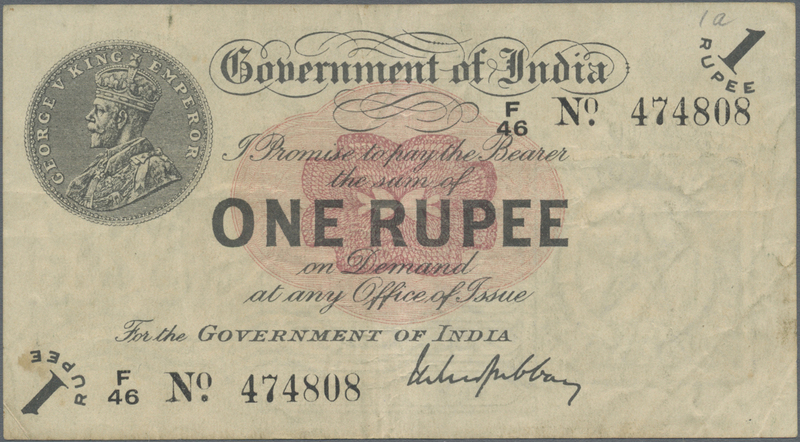 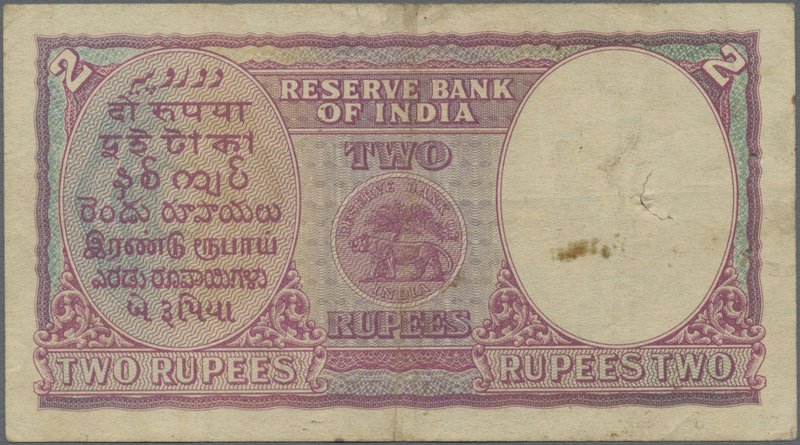 1661 Pick 17b 2 Rupees Reserve Bank of India ND(1937) sign. 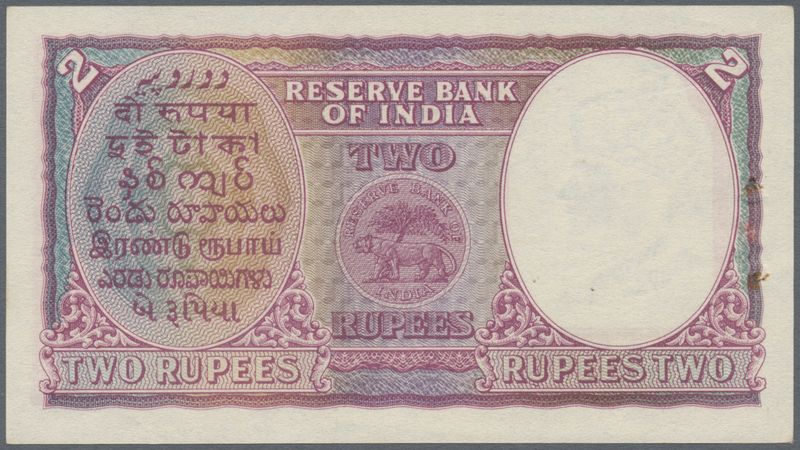 Deshmukh in crisp original condition with usual 2 pinholes at left, only one light corner bend, not washed or pressed, unfolded, original colors, condition: aUNC (with usual 2 pinholes). 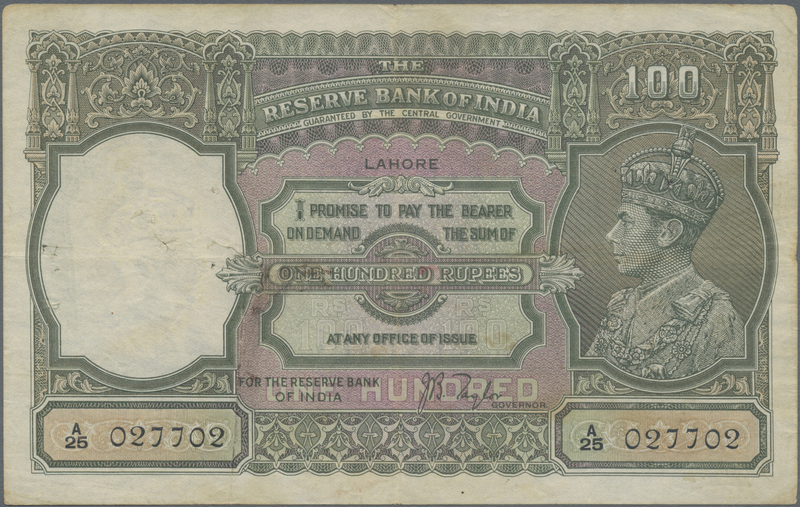 1667 Pick 20 100 Rupees ND(1930) portrait KGIV P. 20, LAHORE issue, used with folds and pinholes in paper, light stain, bank stamps on back in condition: F to F+. 1668 Pick 20a 100 Rupees ND(1937) portrait KGIV P. 20a, BOMBAY issue, only lightly used with 2 pinholes, crisp paper, light handling, condition: XF. 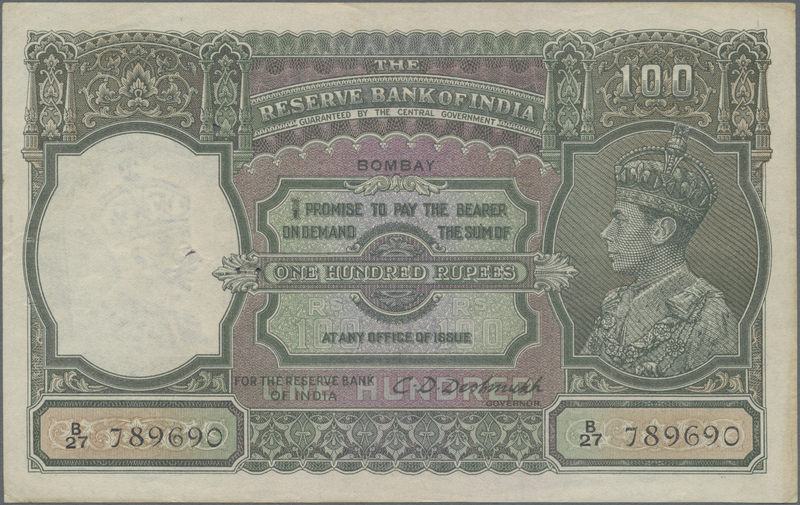 1669 Pick 20b 100 Rupees ND(1937) portrait KGIV P. 20b, BOMBAY issue, only light traces of use, light handling, crispness in paper but some small holes, still original colors, condition: VF, optically appears much better.